From age 13 when my friend Erin’s family saved pennies in a jar to go to The Phantom of the Opera, I’ve dreamed of seeing the Broadway show. The more I found out about the plot of the musical however, the less I cared about the actual story and the more I wanted to see it simply for the music and the spectacle. Okay, let me be honest. I wanted to pay $50 just to watch the dramatic chandelier drop. So today Dan and I paid the pennies from our jar and we watched the chandelier fall… in slow motion supported by super-thick wires. The way I remember hearing about it, the chandelier came crashing down on the audience, barely missing people’s heads and falling so fast that everyone screamed in delighted terror. There was no unscripted screaming in the theatre today as we listened to the hydraulics lowering the giant prop smoothly to the stage. No terror at all. I would have walked out right then and there if it had been intermission and taken a long disappointed potty break out of spite if it weren’t for the fact that the music was so beautiful it made me cry. Now to be honest, I should put the tears in context. I also cried when I saw Reba in concert… and Dave Matthews… and Dido. I cried at the So You Think You Can Dance live show and last week I cried at the gym when a muted commercial for The Biggest Loser: Family Edition came on one of the monitors. But still, the music was gorgeous despite the egregious lack of diction from the chorus (we could not understand a word they were singing) and the pathetically un-near-deathness of the chandelier crash. And I got to wear some hot shoes and hold Dan’s hand (mostly because of the love and only partly because of the spiky hotness of the shoes). The sets and costumes were gorgeous, making me want to light a thousand candles, buy a smoke machine and sew a velvet cloak with a hood to wear whenever Dan and I are cavorting around in underground tunnels bursting into song. I mean, Christine wears a hooded velvet cloak and “strange angel” psychopaths are swarming her practically all the time. What’s not to love about that? The one question that haunted me as I left the theatre was — what did “keeping your hand at the level of your eyes” have to do with the price of eggs? Would shielding his eyes really have kept Raoul from the noose? Honestly? On this lovely Saturday night I offer you some long overdue shout-outs. For those of you living in Utah or visiting my parents in Montana or who aren’t willing to use the power of intention to draw her to you for an impromptu hair session, the church hair lady’s name is Karina Swenson and you can call her at 801-295-2678 to make an appointment. My family portraits were taken by the photographers of Heather Clark Photography and Vincent Arts. They’re both based in Utah and do an amazing job. They’re also my sisters so they’re highly attractive and very pleasant to speak to. 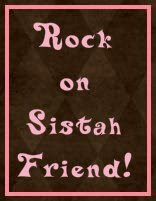 Also, I want to thank Jia at Colour Me Untypical for the Rock On Sistah Friend! Award she kindly bestowed on me recently. It was all kinds of friendly and she wants me to pass it on by listing 3 blogging women who rock, even as I rock. Everyone should be reading them at all times. The End. Motorcycle Guy WE LOVE YOU! Magoo’s decided that all motorcyclists have escaped from some sort of parade and that their main role in this world is to smile and wave at him sweetly like Miss Latina Puget Sound sitting on the back of her white Cadillac on the 4th of July. He waves and smiles and yells, “Hi MOTORCYCLE GUY!! !” and waits for the confetti to drop. It never does, but if one of them waves back, he gasps and regales me with the details of their interchange. “Mom. MOTORCYCLE GUY said HI TO ME! !” Ah yes, his life has been touched by the hand of Motorcycle Guy more than once and he may never be the same. Honestly, I kind of hope he always stays exactly the same as he is now, with his fat little hand waving frantically at the bandana-clad tattoo-happy Harley rider as though the biker were a one-man float in the Macey’s Parade. It’s okay that it’s hard to chew. It’s sort of like meat-flavored gum… that you can eventually swallow. At the RNC Wednesday night, Rudy Guiliani said that no one would ever ask questions about a male candidate’s ability to juggle work and family. He cried sexism. Lots of people are pointing out the sexism inherent in these questions about McCain’s VP choice. And they’re right. It’s unbalanced. It’s sexist. But it’s valid. When a mother of young children enters a presidential race for the first time, these questions cannot be avoided. Join me at Parenting.com to share your thoughts on Sarah Palin. We recently got back from a family reunion in Montana where I spent 10 days hanging with my parents, 4 siblings, 2 siblings-in-law, 2 nieces, one nephew and 2 dogs in one house. It was a blast. However as the week drew to a close, I started noticing signs that it was time to pack it in and head home. 1. All of your conversations degenerate into inside jokes, unfinished sentences and quotes from The Princess Bride and Star Wars. 2. You become so overcome with your niece’s cuteness that you start measuring suit-cases, looking for a place where she can comfortably stow away. 3. You come to realize that you’ve consumed every last morsel of food in the Billings area and have gotten almost too fat to fit in your van for the ride home. 4. After several nights with less than 5 hours of sleep because you can’t stand to be parted from all your best friends, you find yourself bursting into tears over an injustice in a card game and storming away from the table like a spoiled 5-year-old. So you can see the bangs in this picture, fresh from the religious hair salon. They don’t look their super-awesomest because I was more worried about getting one single picture of the whole family without either of the kids pulling crazy faces than I was about my hair. Alas. The price of motherhood. That’s me in the hall. way. sending my daughter to kindergarten. This week Laylee has a kindergarten “soft start.” Today she met with her teacher one-on-one for 20 minutes to discuss important matters like the sounds a “G” makes and whether or not she knows her own phone number. So, needless to say although I’m going to say it anyway, I was more than pleased to find out Laylee had been put in her class. And she does seem like a keeper from the 20 minutes I spent with her today… er Laylee spent with her today while I filled out paperwork in the hallway outside the door and cried my eyes out because Laylee’s growing up so fast and for the love why did I ever stop breastfeeding her. If she were still on the teat, I’m pretty sure they wouldn’t make me send her off into the world. Not that anyone’s making me. I know I could homeschool but this feels like the right decision at the moment, even if it’s tearing my heart out through my left nostril. I sat in the hall filling out forms. How many hours per day would you like to volunteer? What bus will Laylee be taking home from school? What are some of Laylee’s personality quirks or issues? What is your biggest dream for her this school year? And then I lost it. My dream for her? My dream for her? I have a dream. I have many actually. I dream that she will learn to stop calling me really loudly from the backseat of the car, only to mumble in an incoherent whisper once she has my attention. I dream that she will grow to love broccoli. I dream that she will ever begin a sentence to me without using the word “MOM!” at the front of it. I dream that she will learn things that thrill her and cause HER to dream big. I dream that she will grow in self esteem this year and have good friends who help her be better. I dream that she will always know how special she is and how much I love her. I cried as I wrote down a couple of my dreams for her, none of which have anything to do with academics or book knowledge and then quickly wiped the tears away. I didn’t want to be THAT mom, although I’m pretty sure that nearly every first time kindergarten mom is THAT mom. It’s a special sorority of puddlehood that binds us all together. And then I overheard Laylee and Mrs. Sweetsie talking in the next room. Mrs S: So, what does your dad do for his job? Laylee: He does all kinds of hilarious stuff and goes to parties. *Mrs S: He just does fun things at work all day? Laylee: Yeah. Oh man. This one time they took his boss and shoved his face in a BOWL OF WHIP CREAM! Mrs S: And what does your mom do for work? Does she stay home with you or go somewhere else? Laylee: Well sometimes for work she does gardening or just watches us kids and sometimes for work she types things on the computer so people will pay her money so she can buy us stuff. I actually think she got my job pretty dead-on, minus the Cinderella triumvirate of the mending and the sewing and the laundry, and of course the Dr. Mario and the eating of the bonbons. It’s obvious who brings home the bacon in this family. While Dan’s off doing “hilarious stuff” and partying with whipped cream, I’m slaving away at home to make a few bucks. Sad! Here’s a video of a work party a while back where Dan’s co-workers paid their boss $50 to let them dunk him in the creamy white goodness. Dan showed it to the kids and apparently it made quite an impression, erasing Laylee’s every memory of visiting him at MegaCorp, hearing about how he writes code all day and fixes bugs. No. Whipped cream is all-encompassing now. Not a bad job if you can get it. *I’m not sure exactly what Mrs S replied. I was too busy listening for Laylee’s next enlightening tidbit of information to be added to our permanent file. I really think all teachers should write books about all the fascinating things their young students tell them about their home lives.